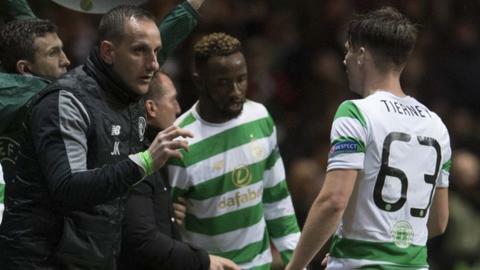 Celtic's players have not had their "heads turned" following Brendan Rodgers' departure, says assistant manager John Kennedy. Rodgers left on Tuesday to take over at Leicester City and former Celtic manager Neil Lennon has taken charge of the Scottish Premiership leaders until the end of the season. Kennedy has moved up from first-team coach to assist Lennon. "The players know they're here until the summer to do a job," he said. Defenders Dedryck Boyata, Emilio Izaguirre and Mikael Lustig are out of contract at the end of the season, while Filip Benkovic, Oliver Burke and Timothy Weah are due to return to their parent clubs. Meanwhile, Scotland left-back Kieran Tierney has already been linked with Leicester, as well as Arsenal. "Seeing how they responded in training, they were fully focused on here and now. There's no heads been turned," Kennedy said. "Initially when you spoke to them, there was a bit of shock but by the time they got their heads round, they got on the training pitch, full focus was on the game [against Hearts]. "We know there's going to be some changes in the summer. Players are out of contract, there's loan players here who will go back to their clubs. In terms of planning, it doesn't stop." And Lennon, whose side are eight points clear at the top of the league and bidding for an eighth straight title, added: "Once you leave Celtic, it's not the same. "I know from my own experience, once you leave the club there's a bit of a hole, something in your spirit that's just not quite the same. It's magical what this club provides for players. "If they are thinking about leaving, I'd make them think twice."